IMPROVED BRAKING EFFECTIVNESS. We have determined that a single pull brake handle modulating both main gear brakes simultaneously is superior in nearly all situations to the standard toe brakes. Materials and drawings are available for retrofit for all builders returning their unused Q2BSW1's & two AN210-1A pullies to QAC. Current kit shipments incorporate this modification as standard. Development work continues on a set of retrofittable hydraulic disc brakes, which may be available as early as October, 1981. Those builders not ready to fly before then may wish to wait and decide whether they wish to retrofit that system instead. .....This section replaces the original section on installing the Brake Pedals (Q2BSW1's) and four inboard pulleys. In place of the individually controlled toe brakes, a single pull handle has been incorporated on the left side of the cockpit. .....Begin by fabricating BS3 and BS5 from the 0.125" thick Aluminum and BS4 from 1/4" plywood. .....BS4 is mounted in position with flox and 2 BID tapes to the top of the fuel tank near the left side console. Position the BS4 so that the handle will be an easy and comfortable reach for the pilot and so it will not interfere unnecessarilly with pilot comfort. .....Next, install the Brake Handle as shown in the sketch. system outboard of the Canard shear web pulley. 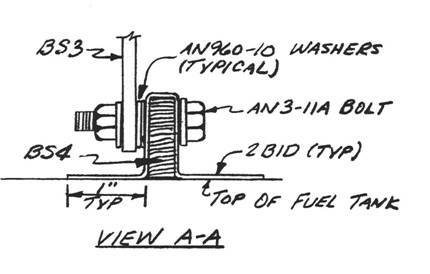 .....The two BS3 Canard shear web pulley mounts shown on page 11-4 must be modified in location for the proper angles. 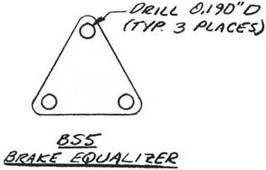 .....The cable routing is from the BS5 Brake Equalizer around the two pullies on the canard shear web, and then outboard through the Elevator slot foam cores as originally indicated. .....The turnbuckles are adjusted to provide equal braking on each wheel.